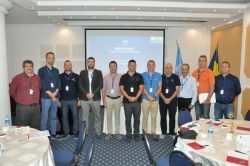 From the 18-21.09.2018 DPPI SEE member states had to opportunity to participate at this year INSARAG team leaders meeting hosted by the Romanian General Inspectorate for Emergency Situations in collaboration with Office for the Coordination of Humanitarian Affairs (OCHA) in its capacity as the INSARAG Secretariat. Experienced USAR practitioners as well as USAR Team Leaders from all over the world working on Urban Search and Rescue (USAR) had the opportunity to exchange on the latest developments in INSARAG. DPPI SEE participants have use the meeting to learn more about the certification process and to network with colleagues. Within DPPI SEE, Romania and Turkey are the only countries with INSARAG certified teams. Their expertise and knowledge of the certification process can be used by the other member states who are considering building such a capacity. DPPI SEE remains devoted to the mission of enhancing disaster preparedness capacities in the region.